Russian Video: Circus School in Russia! 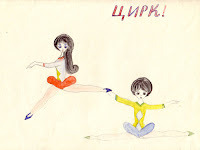 Today we’ll watch a several video fragments about kids who are studying in Russian Circus School. Maybe these kids work too much, maybe they did not play as much as another kids of their age but don’t feel sorry for them. They love circus and they want to work in circus “Because it’s beautiful in circus”. This entry was posted in Theater on July 31, 2009 by admin.